Works of Wine is a unique “art creation experience” which features a one-of-a-kind machine that allows guests to paint with a mixture of watercolor and wine. Special paper is treated with hydrophobic ink to embed invisible geometric patterns that mirror the architectural lines of PMG buildings. The wine and watercolor mixture then added by guests represents the vibrancy added by individuals when they reside in the building. As the droplets fall, the art is revealed. At the same time, the experience is recorded and instantly compressed into a shareable fifteen-second Instagram video. Works of Wine is special because it redefines the balance between art and commerce within the real estate space. The experience proves that a point of view around expression isn’t limited to fashion and art brands. And it also proves that an artistic introduction can drive leads in a category usually dominated by views and floorplans. 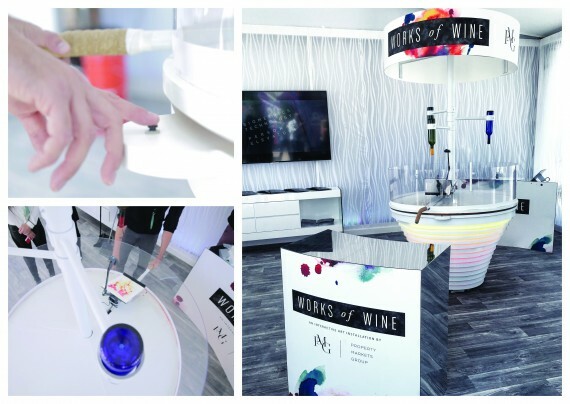 Set in the center of an otherwise stark booth, Works of Wine offered an incredible pop of color and energy. The machine itself was set between a welcome station and an exit station, where the completed art was dried and packaged. supporting the main workspace. Here, guests were able to move 360 degrees, with a cork-wrapped handle as their control and with their art suspended on a small movable platform. The design process was quite intricate as it included: material explorations for the machine body, mechanical experiments to trigger the flow of liquid, bespoke printing to embed the abstract geometric patterns with invisible, liquid-repelling ink and, of course, experimenting to create the mixture of wine and watercolor paint. All while designing a look and logo for the branded experience itself. We were challenged to create an experience which would create foot traffic at the festival, and Works of Wine turned out to be one of the most highly trafficked experiences of the entire event, with guests showing up just to try the experience because of what they were hearing via word of mouth and via social posts on Instagram. We were also challenged to capture new leads for PMG, and well above expectations, 100% of the people who interacted with Works of Wine asked or signed up for more information about PMG buildings. Every single person. Which proved the power of an artistic statement to create interest in the buildings themselves. Guests were rewarded with an inspirational experience, and the PMG brand was augmented with a lens of expression and innovation that has helped offer a point of view behind the buildings they sell.